Fully furnished with linen, duvets and towels provided. No extra charge for cleaning. Large deck with outdoor furniture and BBQ. Master bedroom has its own balcony that overlooks lake and boat ramp. Also on site for your use is a double garage. Pohutukawa Lodge-Lake Tarawera sleeps 7. Lake access is nearby with a selection of excellent beaches. Reserve opposite. Only 3 minutes by car to boat ramp. We have SkyTV, a wide range of indoor games available along with up to date magazines, DVD collection and library. There is also a table tennis table, 2 mountain bikes, volley ball, cricket set, rugby ball, soccer ball available for your use. Enjoy lake edge walks, swimming, fly fishing or explore the lake. Boat charter nearby. Ten minutes drive to the Landing Cafe and Buried Village. Twenty five minutes drive to central Rotorua. Mountain biking tracks 15 minutes drive. Great base to enjoy other Rotorua attractions. Minimum of three nights stay during public holiday weekends. Minimum five night stay during January. Special rates for two weeks or more. Stroll to one of the nearby lakeside beaches. A landline is available for local calls. Good (Spark) cellphone coverage. Electric heating in all bedrooms. We provide good quality linen, blankets and duvets. Wood burner heats the main living area. Dry firewood supplied. Detached garage for two cars or one car and table tennis table. Open plan living room that connects with dining area and kitchen. we supply spices, condiments, tea, coffee and paper goods. Well equipped kitchen. 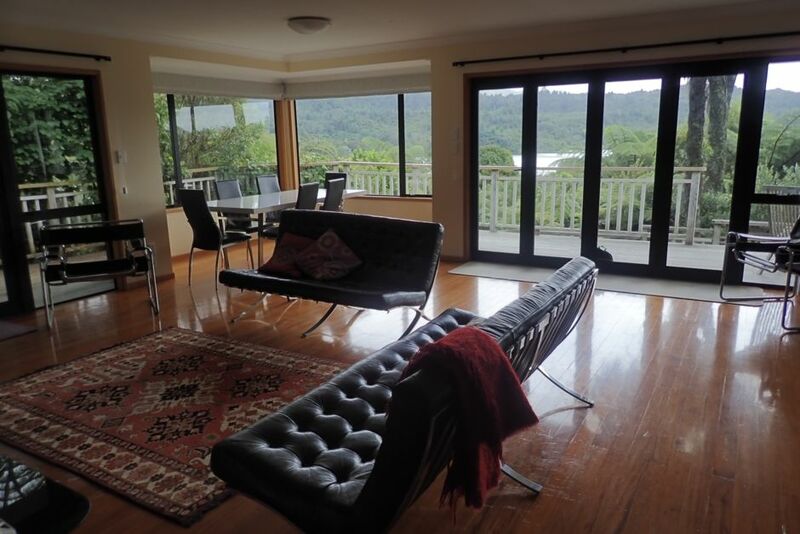 Plenty of natural light with views over Lake Tarawera and to Mt Tarawera. Kitchen windows slide open for easy access to BBQ. Dine inside with lovely bush, lake and mountain views or use the outside table on the deck. Also breakfast bar for snacks. Sky TV. Sports channels and DVD player with collection of movies. Selection of up to date magazines and fiction and on fiction books. Small selection of children's toys and books. Private upstairs balcony off master bedroom. Two bikes for using around Tarawera. Not suitable to be used on mountain bike trails. Deck with BBQ and outdoor dining area. This place has the wow factor.. Views tuis wood pigeons, spaces to chill, relax, the owners very accommodating and made the effort to check in make sure we were happy there via txt message. Very happy book a bachers.. Private property with a great view. Mike is very attentive to ensure you have a great stay. There is beach access just a short walk away. The house is well equipped and clean. Absolutely lovely property - lovely view of the lake - perfect place for pre-wedding photos! Good practical holiday home to access Lake Tarawera, really enjoyed our time there. Good layout for a family to stay in. Would have been useful to know that it was a steep drive and boat needed to be parked at the bottom on road side. Thank you for the nice touch on local honey. Thanks Mike for the great welcome - tidy house, fresh linen, honey from your beehives, soaps and shampoo in the bathroom! It was great not having to do the cleaning either so well done including that in your tariff. The elevated location is superb! We will be back.